It's wartime son! Someone else has licked your lollipop! Such behaviour is unacceptable! To find the culprit play the game! 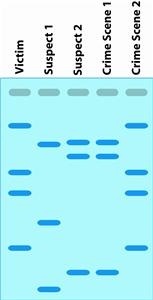 DNA fingerprinting is also very helpful when it comes to determining the parents of a child or more specifically the father of a child. Since every child inherits their DNA fingerprint from their mother and their father, the fingerprint ends up being a mix of the two. It contains traces of the father’s DNA fingerprint and traces of the mother’s DNA fingerprint. In the picture provided there are two diagrams. The one on the top shows that the child’s DNA fingerprint matches strands from the mother’s DNA and the alleged father’s DNA fingerprint. This proves that the alleged father is actually parent to said child. 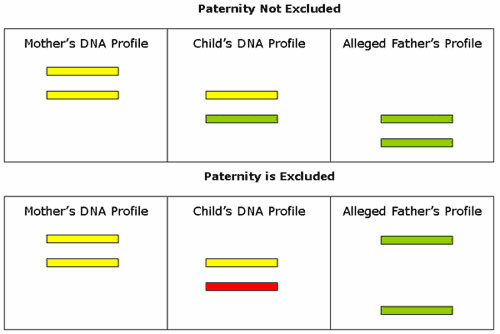 However, the picture on the bottom shows that even though the child’s DNA matches strands from the mother’s DNA fingerprint, it does not match the alleged father’s DNA. This proves that the alleged is in fact not parent to the child. DNA fingerprinting is very helpful when it comes to tracking down criminals. Since every person has a unique DNA fingerprint, it makes tracking down the criminal. The picture to the left contains the DNA fingerprint of a victim, two suspects and the DNA fingerprints found on the two crime scenes. The picture helps to determine who the culprit is. Whichever suspect’s DNA fingerprint matches the DNA fingerprint found on the crime scene is the culprit. The picture shows that Suspect 2’s DNA fingerprint matches the one that was found on Crime Scene 2. This proves that Suspect 2 is the offender.